The demonstration showed the viability of solid-state quantum computers, which—unlike earlier gas- and liquid-state systems—may represent the future of quantum computing because they can easily be scaled up in size. Current quantum computers typically are very small and, though impressive, cannot yet compete with the speed of larger, traditional computers. The multinational team included University of Southern California professor Daniel Lidar and postdoctoral researcher Zhihui Wang, as well as University of California, Santa Barbara physicist David Awschalom. The findings are published in Nature. The team’s diamond quantum computer system featured two quantum bits, or qubits, made of subatomic particles. As opposed to traditional computer bits, which can encode distinctly either a one or a zero, qubits can encode a one and a zero at the same time. 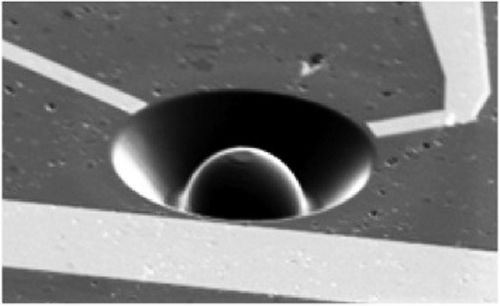 This property, called superposition, along with the ability of quantum states to “tunnel” through energy barriers, some day will allow quantum computers to perform optimization calculations much faster than traditional computers. Like all diamonds, the diamond used by the researchers has impurities—things other than carbon. The more impurities in a diamond, the less attractive it is as a piece of jewelry because it makes the crystal appear cloudy. The team, however, utilized the impurities themselves. Electrons are smaller than nuclei and perform computations much more quickly, but they also fall victim more quickly to decoherence. A qubit based on a nucleus, which is large, is much more stable but slower. “A nucleus has a long decoherence time—in the milliseconds. You can think of it as very sluggish,” says Lidar. Though solid-state computing systems have existed before, this was the first to incorporate decoherence protection—using microwave pulses to continually switch the direction of the electron spin rotation. “It’s a little like time travel,” Lidar says, because switching the direction of rotation time-reverses the inconsistencies in motion as the qubits move back to their original position. “Although interactions between a quantum bit (‘qubit’) and its environment tend to corrupt the information it stores, it is possible to dynamically control qubits in a way that facilitates the execution of quantum information-processing algorithms while simultaneously protecting the qubits from environment-induced errors,” says Awschalom. The algorithm is not new—Lov Grover of Bell Labs invented it in 1996—but it shows the promise of quantum computing. The test is a search of an unsorted database, akin to being told to search for a name in a phone book when you’ve only been given the phone number. Sometimes you’d miraculously find it on the first try, other times you might have to search through the entire book to find it. If you did the search countless times, on average, you’d find the name you were looking for after searching through half of the phone book. Mathematically, this can be expressed by saying you’d find the correct choice in X/2 tries—if X is the number of total choices you have to search through. So, with four choices total, you’ll find the correct one after two tries on average. A quantum computer, using the properties of superposition, can find the correct choice much more quickly. The mathematics behind it are complicated, but in practical terms, a quantum computer searching through an unsorted list of four choices will find the correct choice on the first try, every time. Though not perfect, Lidar and Wang’s computer picked the correct choice on the first try about 95 percent of the time—enough to demonstrate that it operates in a quantum fashion. “This demonstration of performing a quantum algorithm at the subatomic level with single spins suggests a pathway to build increasingly complex quantum machines, using qubit control protocols that circumvent the expected limitations from real materials,” says Awschalom. Researchers from Delft University of Technology in the Netherlands and Iowa State University also contributed to the research, which was funded by the National Science Foundation and the U.S. Army Research Office’s Multidisciplinary University Research Initiative.